The Walking Dead went back to its horror roots in this week’s episode, “Prey.” While I wouldn’t say there was a lot of story in this one, I found it to be pretty fun to watch. It was tense and exciting, and the walkers were even scary. It’s been a long time since they even seemed all that threatening. The episode focused almost exclusively on Woodbury, with only a brief appearance from Rick (Andrew Lincoln). However, I enjoyed the cat and mouse game between the Governor (David Morrissey) and Andrea (Laurie Holden) enough that I didn’t miss them. There hasn’t been a lot going on at the prison lately anyway. At long last Andrea has had enough of the Governor. Milton (Dallas Roberts) warns Andrea about the Governor’s real intentions regarding the prison group, so she decides she needs to warn them. Meanwhile, the Governor prepares a terrifying torture chamber filled with surgical equipment. Clearly he plans to do some serious damage to Michonne (Danai Gurira) when he catches her. I like that the Governor character has gone completely off the deep end. It makes things more interesting. I’m not sure what to make of Milton. One minute he’s spilling the beans to Andrea, the next he’s stopping her from killing the Governor out of some misplaced loyalty. 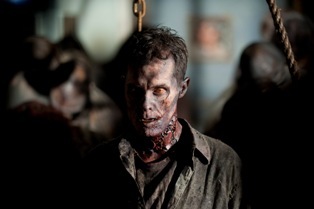 He believes the walkers still have a spark of humanity, and he thinks the same of the Governor. I don’t know where that will lead, maybe nowhere. It makes him seem naïve, though we know he knows everything that’s going on. 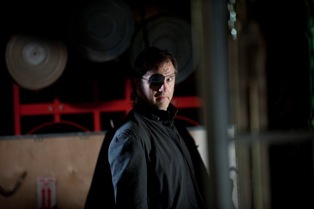 So Andrea takes off and the Governor goes after her. No matter where she runs, he’s always just a step behind. Just like in a horror movie, he never stops coming. Even when she traps him in a room full of walkers, he’s relentless. I liked that they brought that kind of intensity back to the show. Lately the zombies have been secondary to the melodrama, so it was good to see them back to the forefront of the situation. Speaking of walkers, the Governor is still rounding them up to use for his own purposes. Tyreese (Chad L. Coleman) and his sister Sasha (Sonequa Martin-Green) start to have reservations about their new home. Unfortunately their companions Allen (Daniel Thomas May) and Ben (Tyler Chase) are ready to fall in line with whatever the Governor wants. Tyreese and Sasha seem like the only normal people around. I was glad to see that not everyone has become incapable of making a good decision. So the question in this episode is: who torched the captive walkers? They made it seem like Tyreese at first, but then things started to point toward Milton. Like I said, I’m not sure what Milton’s deal is. The episode ends with Andrea captured and sitting in the Governor’s torture chair. No one knows she’s there. Not even the Governor’s closest henchmen. I don’t know that I want to see what he plans to do with some of those tools. With only two episodes left, I’m betting on at least one major death of one of the “good guys.” Who do you think it will be? I was thinking Andrea, but maybe that’s too obvious. Maybe Glenn (Steven Yeun) or Maggie (Lauren Cohan)? Either of them would be a surprise. Daryl (Norman Reedus) would probably be the biggest surprise, but I don’t think they will do it, given the character’s popularity. With only two weeks left, it won’t take long to find out. Hopefully they’ve got some real surprises left to reveal.